Badwater Basin, at 282 feet below sea level, is famously the lowest point in the United States and therefore one of the main attractions in Death Valley National Park. The desert area in eastern California draws visitors from around the world. 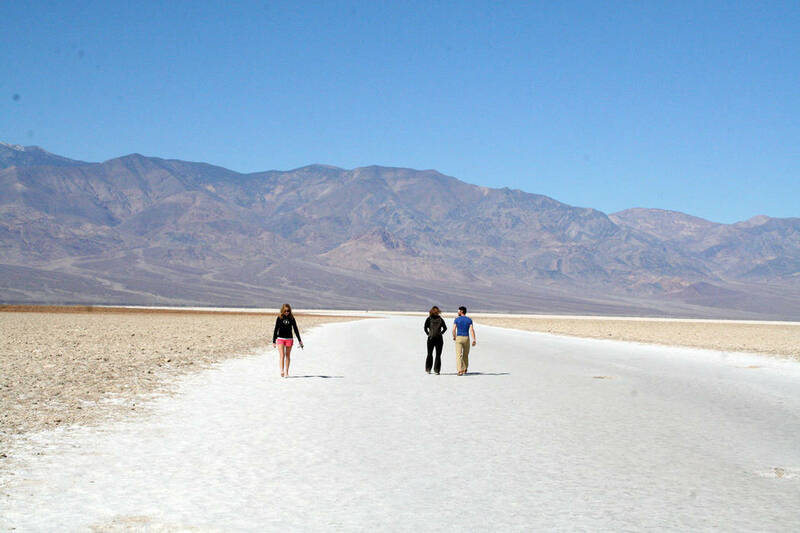 (Deborah Wall) Visitors to Badwater Basin in Death Valley National Park walk the salt flats. (Deborah Wall) Badwater Basin in Death Valley National Park is at 282 feet below sea level. 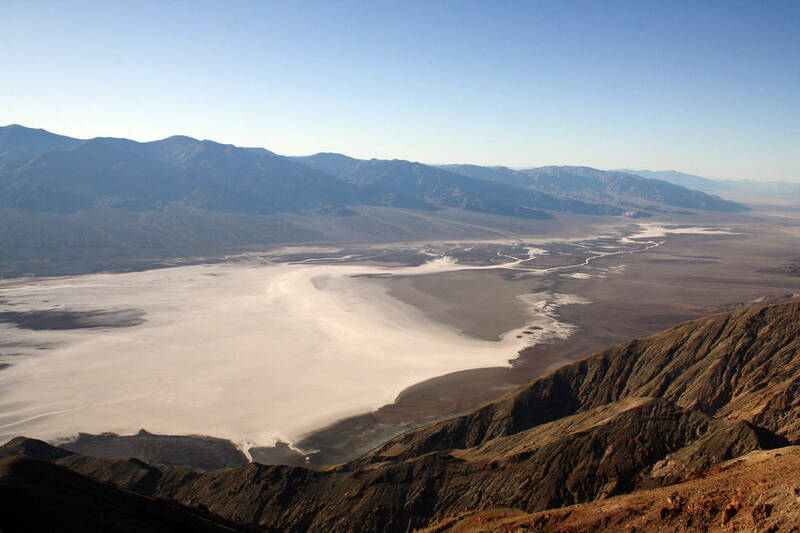 Deborah Wall Badwater Basin, as seen from Dantes View, is the lowest point in the United States. It is located within Death Valley National Park. The park is about a three-hour drive from Boulder City and can be visited in a day. From the parking area at Badwater Basin, head out on the wood boardwalk and then down onto the salt pan itself. The path, leveled by visitors’ footsteps, is flat and looks like packed-down snow. In this area you can take off your shoes and walk barefoot, experiencing what it would be like to walk on snow, if snow were warm. Most people walk just a couple of hundred feet out from the parking area and return, but if you travel about a quarter mile or so you will encounter the more rugged terrain of polygonal salt formations. These are hard to walk on but a wonderful natural curiosity. Looking west from the salt pan, you will see the Panamint Mountain Range and the park’s highest point, Telescope Peak, at 11,049 feet. It’s usually covered with snow this time of year. This is one of the few places you will literally see such a disparity in elevation. Another view you won’t want to miss while in the parking lot is the sign that marks sea level. Turn around and look high up on the cliff across the road. It’s pretty surreal. As you drive north back to the Furnace Creek area of the park, be sure to take the right-hand turn for the 9-mile, one-way Artists Palette Drive. Multicolored formations in these badlands are spread before the visitor like a feast for the eyes. Since you will be visiting the desert, where temperatures range from the mid to low 70s this time of year, be sure to bring sunglasses, a hat and drinking water. Services are limited in the park. From the hub of Death Valley National Park, Furnace Creek Ranch, head south on California 190 east for 1.2 miles, then turn and right onto California 178 (Badwater Road). Drive 17 miles to the parking area at Badwater Basin, located on your right.